Innovations are, by now, widely recognized as a key source of economic growth and as a useful instrument to face the competition brought about by the forces of globalization. Not surprisingly, innovations have acquired a crucial role in the growth and competition strategies of many firms, as indeed of many countries and economic regions. A strong trend of internationalization of R&D and even globalization of innovation ("Global Innovation") may be observed across all countries actively participating in the global economy. Traditionally, there have been examples of R&D work by foreign companies in developed, industrialized economies. For instance, affiliates of foreign-owned firms spent nearly 3.5 billion euros on R&D in Germany in 1993. Latest figures (available for year 2013, released 2015) suggest that R&D expenditure by affiliates of foreign firms in Germany had increased more than three-fold to 11.9 billion euros (22.6% of domestic R&D expenditure). Thus, almost one-fourth of R&D-spend in Germany is carried out by affiliates of foreign firms. This development has been, however, stagnating for some time, which is an interesting development. On the other hand, R&D spend by foreign affiliates of German firms has increased. They spent 17.3 billion euros on overseas R&D efforts , which constituted 31.3% of the total R&D budget of domestic MNCs. While Germany's pharmaceutical industry spends more than 52% of its R&D budget abroad, the automotive industry, now, also spends 22.6% of its R&D budget at overseas locations, up from 18.3% about 4 years back in 2009.. This phenomenon has also been spreading more and more towards "emerging economies" known for their scientific capabilities. 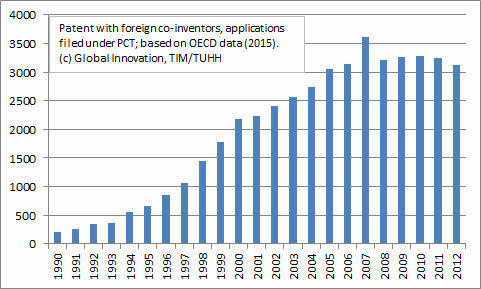 This trend is reflected in the increasing number of offshore R&D centers located in emerging economies such as China and India and in the increasing number of patents granted to multinational firms on inventions made at such foreign locations, as a recent analysis (March 2012) by us shows. For instance, most of the DAX-30 firms in Germany that conduct in-house R&D, have established R&D presence in India, as a study of ours showed. The activities are often organized in the form of an offshore captive center, an international joint venture, a third-party offshore outsourcing contract (contract R&D), or a cooperation with academic and/or research institution abroad. Under the aegis of Research Programme "Global Innovation" we seek to observe, analyze and forecast developments in the field of globalization of innovations. This programme is an initiative of the Institute of Technology and Innovation Management (TIM) at Hamburg University of Technology (TUHH) and was launched in January 2007. It originally consisted of two major studies to understand the impact of Offshore R&D. In the meantime its scope has been extended to include trends like "Bottom of the Pyramid" (BOP), "Grassroot Innovations" and "Frugal Innovations". Additionally, we also monitor outward foreign direct investments (FDI) from emerging economies, especially in their technology-seeking aspects. India and Indo-German economic relations stand in a particular - though non-exclusive - focus of our studies at present. 2.8.2017: New publication: "Innovation Pathways and Trajectories in India’s Auto Component Industry", authored by Rajnish Tiwari and Katharina Kalogerakis. 30.03.2016: New publication: "Frugal Innovation in Scholarly and Social Discourse: An Assessment of Trends and Potential Societal Implications", authored by Rajnish Tiwari, Luise Fischer and Katharina Kalogerakis, a joint working paper of Fraunhofer MOEZ and TIM/TUHH as a part of the BMBF-ITA project. 30.11.2015: "Relevance of Frugal Innovation in today's Germany and the Avenues of Indo-German Collaboration", talk by Rajnish Tiwari at the meeting "GIRT Hamburg goes Bremen", a joint meeting of German-Indian Round Table Hamburg and the Deutsch-Indische Gesellschaft Bremen. 3.11.2015: "Autos für Indien und Handys für Oma: Wie „frugale Innovationen“ die Berufswelt verändern", an article on frugal innovations and their impact on the profession of engineers. Authored by Nadine Bös, this article in the leading German daily Frankfurter Allgemeine Zeitung (FAZ) also reports beautifully on our research related to frugal innovations. Nov. 2015: Hamburg celebrated an "India Week", where TIM/TUHH is actively invloved. Among other things we co-organized a symposium on renewable energies in the Indian context. Also listen to a radio interview of our team with the External Services Division of All India Radio on the topic of "Indo-German Collaboration in Technology"
12.08.2015: TIM/TUHH gewinnt Forschungsförderung im Rahmen der ITA-Ausschreibung des BMBF: "Frugale Innovationen als Trend in westlichen Industrieländern"
This website is optimized for a display of 1024x768 Pixels on Internet Explorer 6.0.